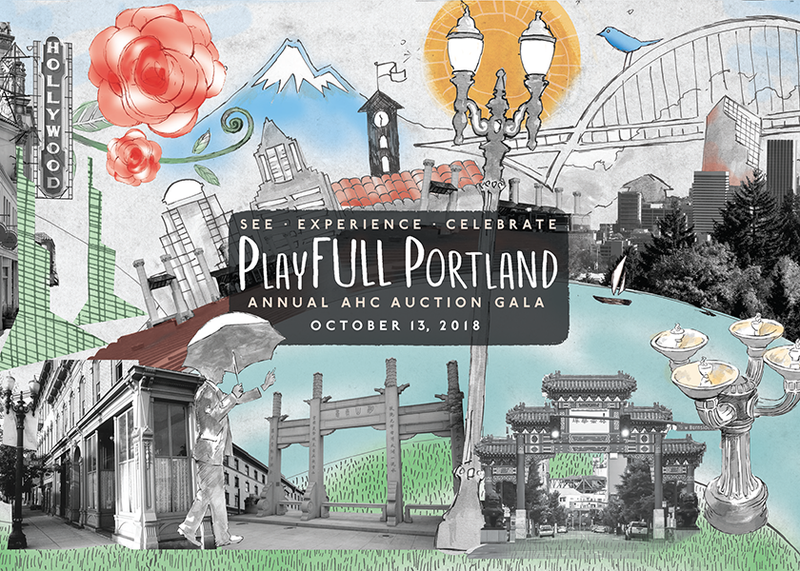 AHC Auction Gala "PlayFULL Portland: See. Experience. Celebrate." Celebrate the many historic destinations and play spaces in Portland and our region! The Architectural Heritage Center’s Annual Auction Gala has unique items to bid on, from vintage collectibles to vacation getaways and special experiences around the city and in Oregon. Held at the historic Melody Ballroom, the evening will include a glass of bubbly, dinner, beer and wine, and a live and silent auction. Enjoy live jazz, Latin and pop music by a trio featuring Adlai Alexander and Laurent Nickel. Dinner includes either roasted red pepper chicken or vegetarian lasagna (you will make your meal selection at time of ticket purchase). *Patron Benefits include 5:30pm early entry reception with hors d’oeuvres and drink ticket, and parking (first come, first served). Auction design and illustration by Reid Cooper of Cooper Design.